When discussing food storage, storing water should be at the top of the list. Preparedness minded individuals know that food storage doesn’t do a bit of good if there isn’t any water, to sustain life. We all need water to survive. You can live 3 weeks without food, but without water, you only have 2 or 3 days. This makes water a higher priority than food. Water is very heavy and it takes up a lot of space, this makes it rather problematic to store. You need a gallon of water, each day, for every member in your household. This gallon is just for eating and drinking use. In a perfect situation you would store 3 gallons a day so everybody can wash up at least once a day. You don’t want to encourage the spread of germs in a survival situation and it will keep the surrounding environment a bit more pleasant if you can get everyone to stay clean. Your drinking water is the stuff you want to preserve. Your washing up water isn’t quite as sensitive. Rain barrels are perfect options for storing a lot of water, without taking up precious storage space. You can put a rain barrel under anywhere with a downspout or even at the corner of your roof. If you have a pond or river nearby, you may have your washing water needs covered! Milk jugs always seem convenient, but don’t use them to store water. They aren’t designed to last and will eventually start to leak making everything around them wet. Choose the thicker, more durable plastic bottles or jugs, that juices are packaged in. 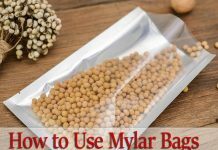 Mylar bags are nice options for storing water. They can keep for up to two years and do not need to be rotated. There are plenty of containers available to store your water in, but it is extremely important you only use food grade containers. Never, ever use containers that have held anything but food in them. To do otherwise may expose you to some pretty toxic stuff! Water should be stored away from direct light. Light can cause a breakdown of the water, leave it tasting funny or “off”. When this happens, freshen up the stale tasting water by pouring it back and forth between two containers to aerate it. Water stores need to be rotated. A good rule of thumb is to rotate your water supply every year. 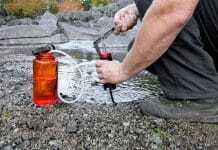 Maybe you have a pond or river close and neglected to store drinking water. 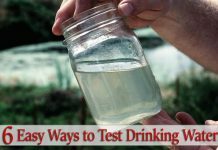 Do not start drinking bacteria-laden water straight from the river or pond. You need to clean it first. Dip the water into a container, with a piece of cloth over the opening to filter out the larger sediment. The boil the water for five minutes to clear out all the nasty bugs that would have a negative impact on your digestive system. Once you boil it, you may still want to add a little bleach. Yes, normal household bleach can be used to purify water, when used correctly. 1 quart of clear water – 2 drops of bleach. A gallon of clear water – 8 drops of bleach. a 5-gallon container of clear water – ½ teaspoon of bleach. If your water is cloudy, you will need a little more bleach, so double the amount of bleach, that you would add to clear water. 1 quart of clear water – 4 drops of bleach. A gallon of clear water – 16 drops of bleach. a 5-gallon container of clear water – 1 teaspoon of bleach. After you add the bleach, let it sit for half an hour then aerate it, by pouring it back and forth between two containers, before you drink it. 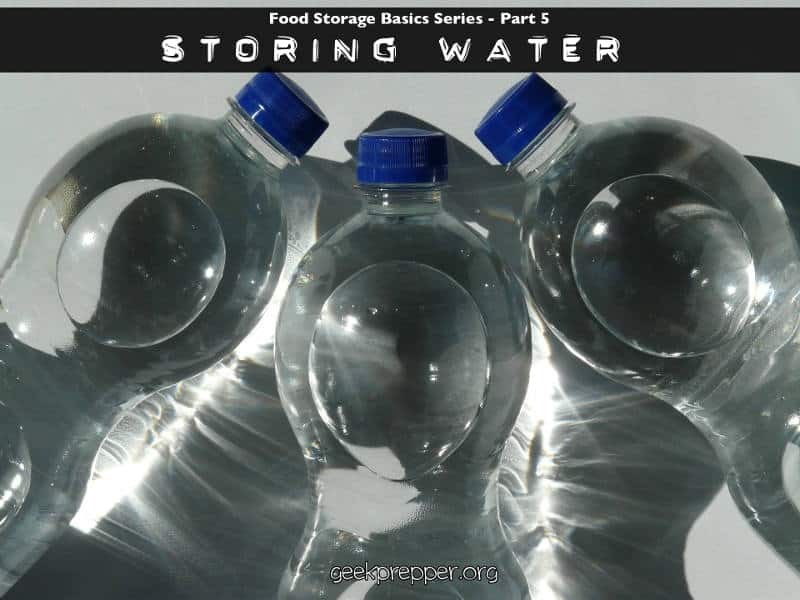 We have added the links to the other Parts (currently 1-4) to the bottom of each posts in the Food Storage Basics Series. Keep reading because this is an 8 part series, so there’s 3 more coming soon! oops, i meant CALCIUM hypochlorite, not sodium. 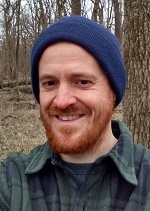 see the article on this website on the subject. I try to keep 7 gallons of water per person in my household at all times and then rotate the water by using and refilling the containers on a near daily basis. I drink a lot of water so my complete supply gets replenished every 7 to 10 days.